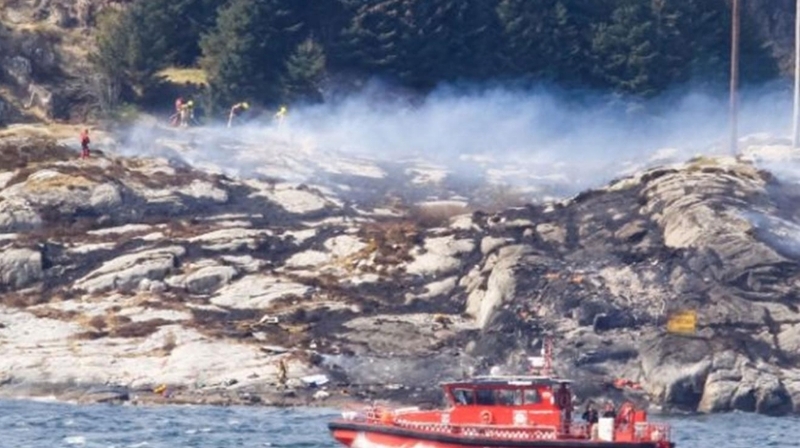 A helicopter has crashed off the west coast of Norway near Bergen. A number of people are visible in the sea, while the helicopter was totally destroyed, witnesses told the TV2 news channel, as cited by Reuters. “We have received many, many reports of a helicopter crash just west of Turoy near Bergen. Many people have reported that they heard an explosion and saw smoke. We can confirm that a helicopter has crashed and that there are people in the sea,” police told the Verdens Gang newspaper. Norwegian police have told the broadcaster NTB that there were 13 people on board the helicopter when it came down. The area has frequent helicopter traffic servicing offshore oil platforms in the North Sea off the Norwegian coast. The Rescue Coordination Center has yet to receive any information about any survivors. According to the Bergens Tidende newspaper, police say they have found dead bodies, as the rescue attempts continue. The dead bodies were found on land, though the exact number of those who perished has not been announced. “We do not know the sequence of events or what the helicopter to come down,” Bjorn Jarle, from the Rescue Coordination Center for South Norway. Bergen is the second-largest city in Norway. Reports say there was no problem with the weather as conditions were good for flying, according to local meteorologists. The helicopter that came down is believed to be a Eurocopter and was owned by the CHC Helicopter Group, which specializes in providing offshore transportation to the oil-and-gas industry. Norwegian oil company Statoil has confirmed to the Aftonbladet publication that the crashed helicopter came from the Gullfaks B platform – a North Sea oil field operated by Statoil. Ivar Moen, from the Rescue Coordination Center for South Norway, told Verdens Gang that diving equipment is being brought to help with the rescue operation. “There are a lot of people who can help in the area, but the Rescue Coordination Center has requested vessels with the capacity to dive. The Norwegian Stealth Frigate, the Otto Sverdrup will help with the rescue attempts and is heading to the area,” he said. Statoil is setting up an emergency center in Bergen, while it confirmed that 11 of those on board worked for the oil firm. The oil giant has also said that all helicopters of a similar type to the one that crashed have been temporarily taken out of service.